NES Bionic Commando (JPN) in 14:05.53 by Genisto. 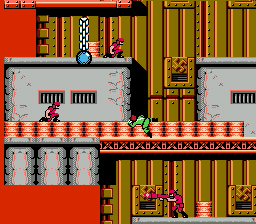 Resurrection of Hitler: Top Secret (ヒットラーの復活) is the original (Japanese) version of Bionic Commando. It is a platform game with a hero who can't jump but can quickly latch onto objects with his bionic arm. One can guess from the game's title that the hero's objective is to end the Nazi's efforts to resurrect Adolf Hitler. This TAS is about 0.5 seconds faster than the previous version; it merely changes some very minor parts. "HnF" has more enemies in every stage, and more obstacles along the way. For example, there are land mines in Area 7 and giant spiders in some neutral areas. Also, I believe the patterns of the enemy attack trucks are different, because I seemed to encounter them more often in this game despite using the same route as "BC." All references to Nazis and all swastikas were removed from "BC." The evil leader of "the Badds" was re-named "Master-D." Graphically, however, he is undeniably Adolf Hitler in both versions. This resulted in quite a shock to me as a child!